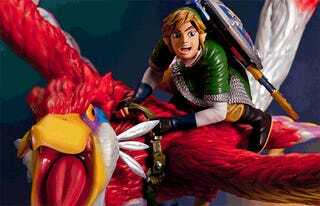 First 4 Figures' newly-announced Link on the Crimson Loftwing statue is a two-foot-tall tribute to the joy of taking to the skies in The Legend of Zelda: Skyward Sword. Just try not to make eye contact. The first in a series of new statues based on the 2011 Wii game, Link on the Crimson Loftwing is one of First 4 Figures' biggest pieces yet, measuring 26 by 23 by 25 inches. The Crimson Loftwing carries his chosen companion aloft, soaring above a base of stylized clouds. It's quite an impressive piece, easily the finest work I've seen come out of First 4 Figures yet. The face may look a bit manic from the front, but taken from the side it gets its message across quite nicely. This is not a statue one adds to their collection. This is the sort of polystone piece that serves as the centerpiece of the collection, the other bits crowding around it to bask in its glory. Link on the Crimson Loftwing is now available for preorder at First 4 Figures, with an estimated shipping date of the second quarter of 2015. It's limited to 2,500 pieces worldwide, and the asking price is a hefty $459.99. It's a little pricey, but could you really resist this face?